Almost good enough to end a relationship over. I adapted this from Jane Brody’s “Good Food Gourmet.” What’s amazing is that these pancakes are also health-conscious-ish. I pour the batter sparingly, into small circles, slowly so they don’t run (three per pan) and they have a delightful crispy fried feeling (vs cake-y and dry.) Garnish with strawberries, bananas and riccotta cheese. Maple syrup also de rigeur. 1. In a large bowl, combine the dry ingredients, mixing them well. 2. In a medium bowl, beat the egg lightly, and add the buttermilk and vanilla, mixing well. 3. When you’re ready to cook the pancakes, lightly oil your frying pan with canola oil, coating surface well, heating over medium. Then make a well in the dry ingredients, and pour in the wet ingredients, mixing just enough to moisten. Do not overmix. 5. 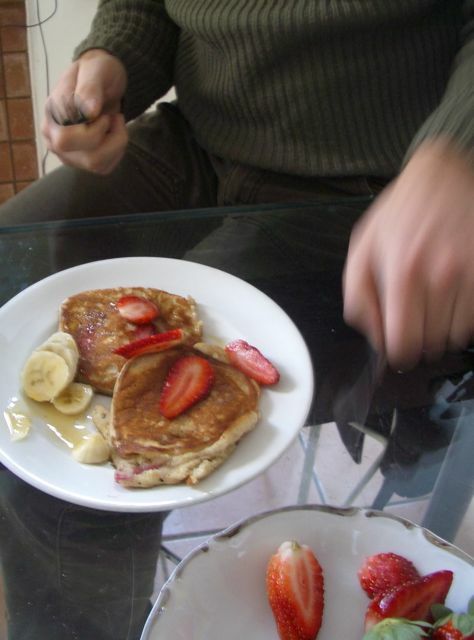 Garnish with syrup, or tablespoon of riccota cheese and additional sliced strawberries and bananas.